The APGAR Scoring System was developed by Dr. Virginia APGAR as a method of assessing the newborn’s adjustment to extrauterine life. 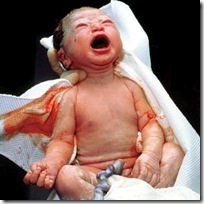 It is taken at one minute and five minutes after birth. With depressed infants, repeat scoring every five minutes as needed. The one minute score indicates the necessity for resuscitation. The five minute score is more reliable in predicting mortality and neurologic deficits. The most important is the heart rate, then the respiratory rate, the muscle tone, reflex irritability and color follows in decreasing order. A heart rate below 100 signifies an asphyxiated baby and a heart rate above 160 signifies distress.